Where to Buy Detex Blox, Detex Blox Lumitrack Biomarker - 8.8 lbs - $49.55 for Sale with Fast Free Shipping! Detex Blox Lumitrack Biomarker - 8.8 lbs is a non-toxic monitoring & tracking bait with lumitrack biomarker that makes rodent droppings glow bright green under black light. NB Natural Squirrel & Rodent Bait Lure - 1..
Blacklight Master 9 LED UV Black Light Pest..
Droppings from rodents that have consumed detex with lumitrack biomarker apear normal under regular light but glow a bright neon green under black light. By tracking those droppings, PMPs can identify the specific species and size of an infestation, as well as track rodent movement to harborage and nesting areas. Active burrows become visible under black light, as well. It ideal for monitoring rodent activity in schools, food warehouses, zoos, parks and other sensitive accounts. Once rodent activity is detected, PMPs can replace the non-toxic bait with Bell's rodenticide baits, traps or other rodent control products to get rid of an infestation. The 20 g BLOX is made with Bell's highly palatable bait formulation containing human food-grade ingredients. A hole through the center of the Blox lets PMPs secure it on vertical or horizontal rods inside Bell's tamper-resistant bait stations. Bait should be placed in bait stations or otherwise secured and out-of-reach of non-target animals. Place bait around the periphery of buildings, especially near likely locations of rodent entry, and in areas that provide rodent harborage. Record locations for future reference. Rats: Place 1 DETEX BLOX every 30 - 50 feet. Mice: Place 1 DETEX BLOX every 6 - 14 feet. Inspect bait at least monthly for rodent activity and more often during the autumn season. Replace spoiled bait immediately. 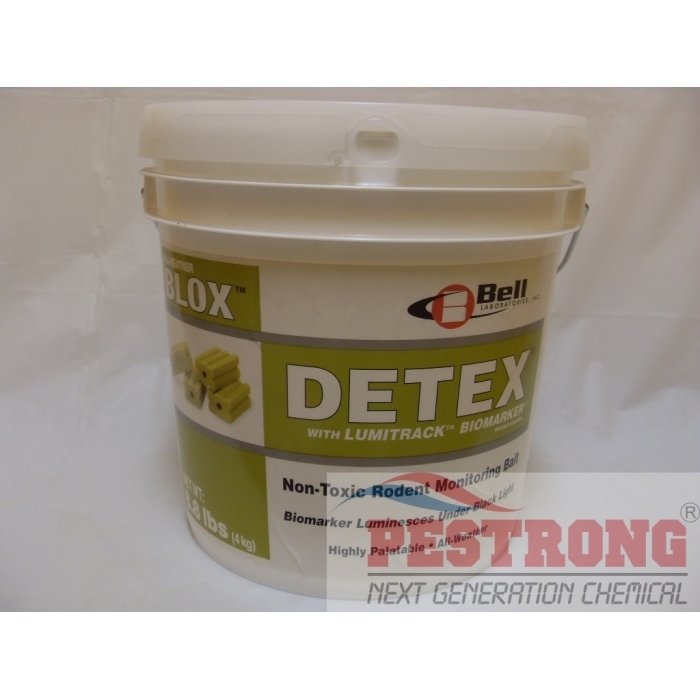 If the bait has been gnawed or eaten, replace DETEX BLOX with toxic bait or traps as appropriate until the infestation has been controlled. DETEX BLOX is non-toxic and may be disposed of in the same manner as other food products. I found cheap rodent control solution with this. Due to regulation, I have to buy big size - 16 pound. until find this one. plus benefits with lumitrack. Thanks.